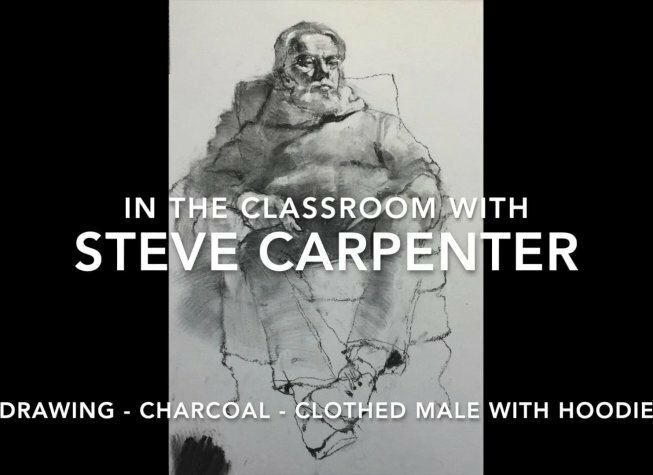 Two main topics are addressed in this charcoal portrait video. Steve demonstrates his charcoal technique for rendering portraiture. Emphasis is placed on facial detail, hair, and the beard. Tips for charcoal drawing of clothing are explored with special attention to the importance of design in rendering fabric. Line, value, form, shadow, highlight, scale, and design are all concepts examined in this demonstration. In this charcoal drawing demonstration Steve demos Steve Carpenter charcoal method that helps beginner or advanced student advance quickly in charcoal drawing mastery.